Lytham & St.Annes on the Sea Lancashire - Local History - An open letter to the ratepayers of Lytham West Ward from John Smethurst, Links View Ansdell, September 14th, 1926. 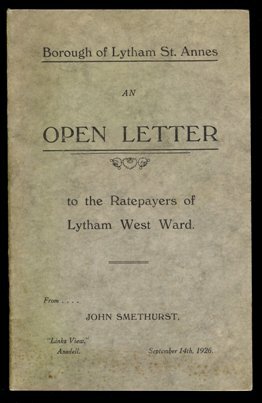 An open letter to the ratepayers of Lytham West Ward from John Smethurst, Links View Ansdell, September 14th, 1926. Contains Information, facts & figures about the Borough of Lytham St.Annes.